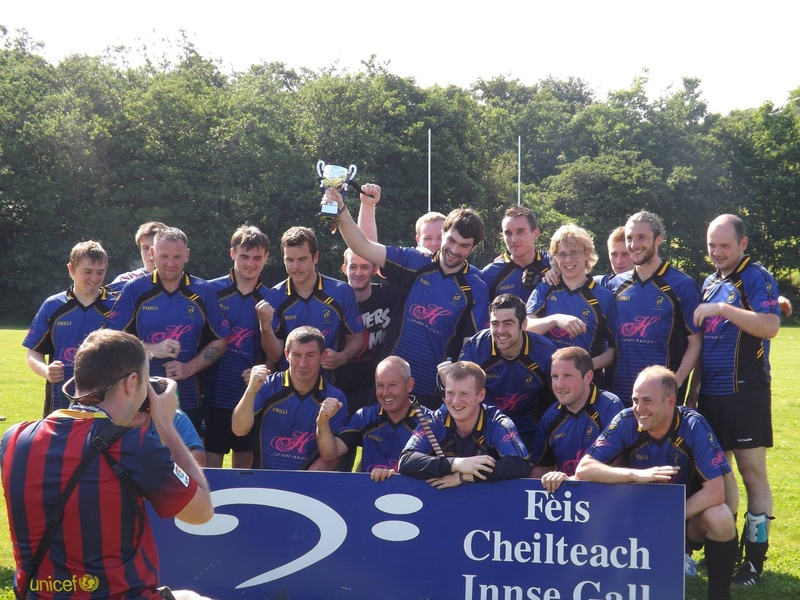 A big mealaibh ur naidheachd to everybody at the club for a supreme effort on Saturday, both on and off the park. 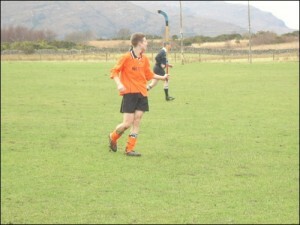 A club record win was just reward for a magnificent performance against Uist. Thanks as always to Caroline and the whole HebCelt team for their generosity but also to the many, many supporters who turned out in force, we are glad we entertained you! Thanks to Kenny for collecting as usual! A bang up job well done! Duncan opened the scoring with a dazzling hat trick and his second was the pick of the bunch, Donald then popped home the fourth, then Will grabbed a deuce to make it 6-0 at halftime. In the second half, we were able to relax and this gave lots of guys serious game time, the only goal of the half again came from Duncan who made it 4 on the day and eased himself ahead in the scorers’ charts. 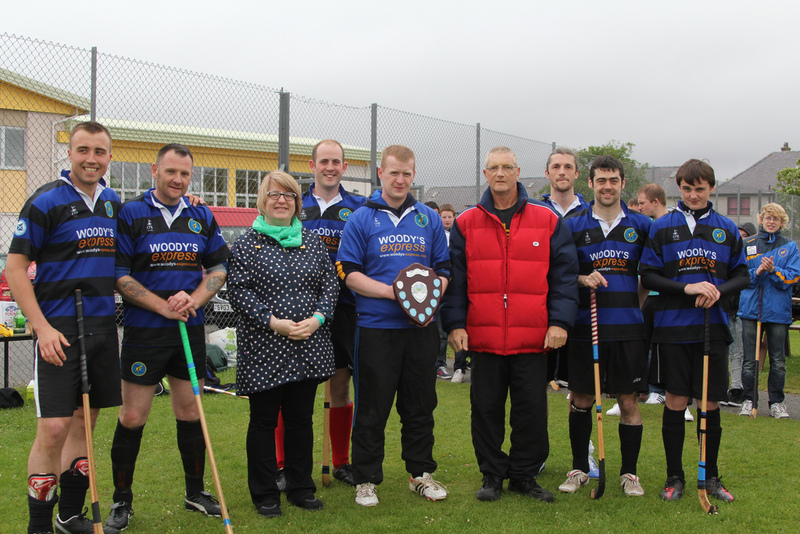 Angus MacVicar from the Camanachd Association presented the cup and was very impressed by the skills on show from both teams. 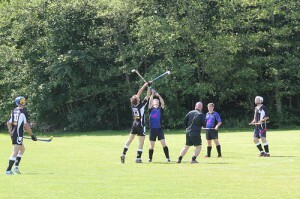 Gaga was captain for the day and put in a mighty performance as usual. 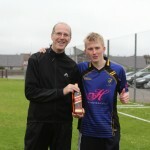 Duncan was man of the match although Dougie Shaw was always in with a shout. No rest for the wicked however! We have a massive game on Saturday against Lochaber who can win the league in Shawbost. As much as we enjoy the classy guard of honour of the park, let’s get training hard this week and try and push up the league. That time of year again! 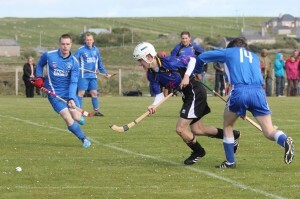 The big derby of the year with Uist is this Saturday, 2PM at Bayhead. Big thanks as always to Caroline MacLennan and the whole Hebridean Celtic Festival team for their hospitality and support of this fixture which has been crucial to the development of shinty in the Western Isles over the last few years. 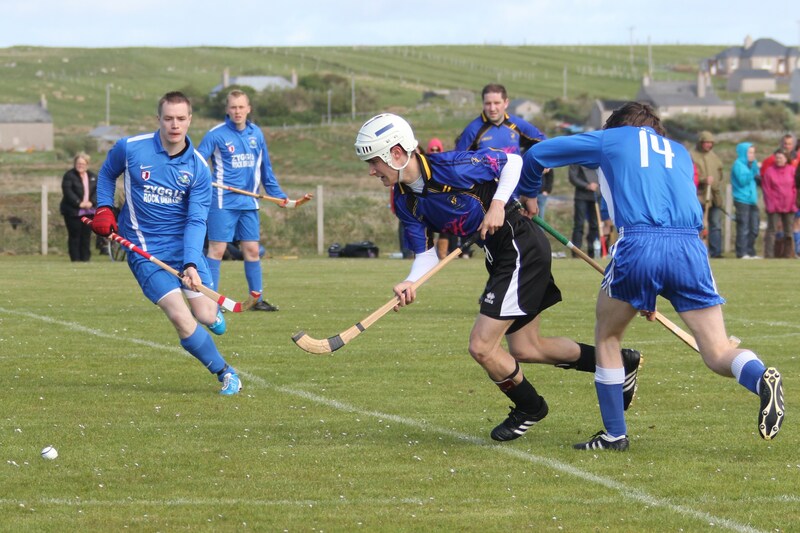 The fixture was started in 2007 but with Uist unavailable the game was played between Camanachd Leodhais and a Hebcelt Allstars team which had some guests over for the festival cameo. This was played at the old Acres Pitch which is now a car park. Lewis won 3-0. There are no photos in evidence! The 2008 version was played over two legs, with the first game held in North Uist at Easter. Lewis won that game 4-2, but the game at Smith Avenue on the Saturday of the Festival was a close 2-2 draw, with Lewis grabbing the draw in he final seconds to secure the cup. In 2009, there was a cloud over proceedings with the recent death of Craig Morrison. On a rainy day which seemed to reflect the mood, in that sense the result was secondary although Uist played well to win 3-0, their first win in the competition and the first time the fixture was played at Bayhead. In 2010, Lewis made an emphatic 4-1 win as the fixture returned to Bayhead, with Titch Morrison, Calum Stamper and Paul Duke piling in the goals. The weather again was fairly inclement in the run up, but the game still drew a sizeable crowd as the weather improved rapidly in the second half. 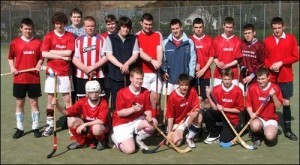 2011 saw a Lewis team in their first season in the North leagues up against a Uist side who put up a good fight (although the fixture was reduced to 10 a side) in a 3-2 classic in blazing sunshine. Perhaps upwards of 500 people attended the match. In 2012, Uist, with a couple of mainland additions caught Lewis napping and won the cup 2-1 on penalties after a 2-2 stalemate. 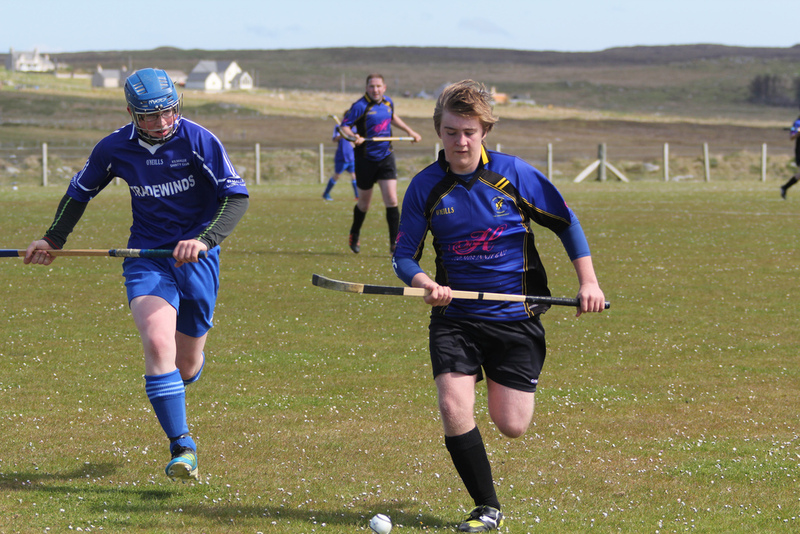 There was some more fine weather and another bumper crowd, which meant a good day for Hebridean Shinty no matter the result. What 2013 brings is anyone’s guess but hopefully with Cornwall’s Matt Mossop in the middle and a good weather forecast it can be another cracker and hopefully there will a Leodhasach hand on the trophy when it is raised. Don’t miss out. Been a couple of agonising defeats recently, 4-3 to Kilmallie and 3-2 to Inverness. All we can do is keep training hard and keep moving forward as always. Training every Tuesday and Thursday. 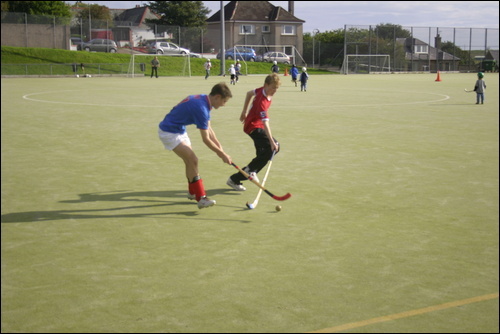 Eoghan and Ally Lamont will be running the kids summer camps at Smith Avenue Wednesday to Friday this Week. 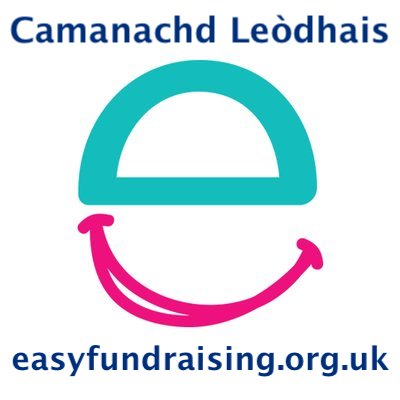 Thanks to Comhairle nan Eilean Siar’s Motiv8 Programme for their support, we have almost 20 kids signed up. 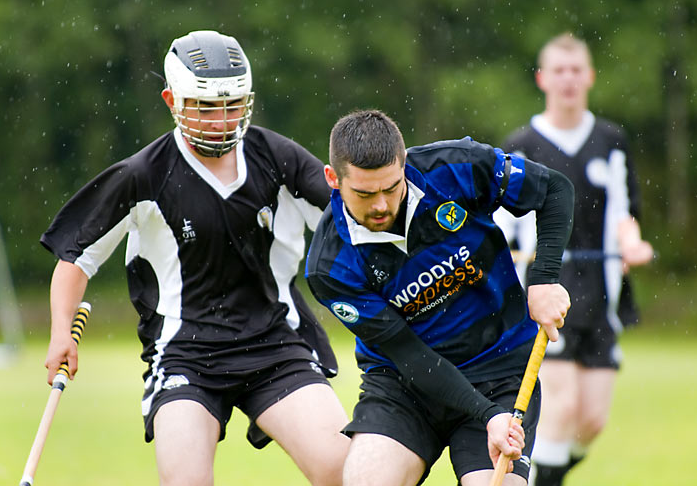 As a club we’d like to mark the first ever Camanachd Leòdhais wedding with a tribute to the man in the middle tomorrow, Sean ‘Gob’ MacLeod as he prepares to wed his beloved, Joanne MacDonald. The boys are buzzing for the ceremonies and we’re looking forward to carrying on after the Kilmallie game. 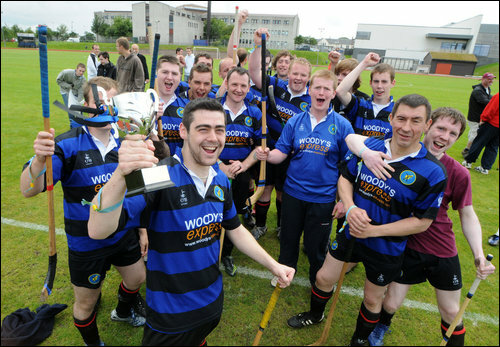 Sean is an Honorary Chieftain of the club, having been elected the club’s first President in 2006. Sean played throughout the cup years but the highlight of his early career was attending the Camanachd Association U17 Development Camp in Summer 2007 which then resulted in a call up to the 2008 Development Squad which toured Ireland and where Sean scored a goal. 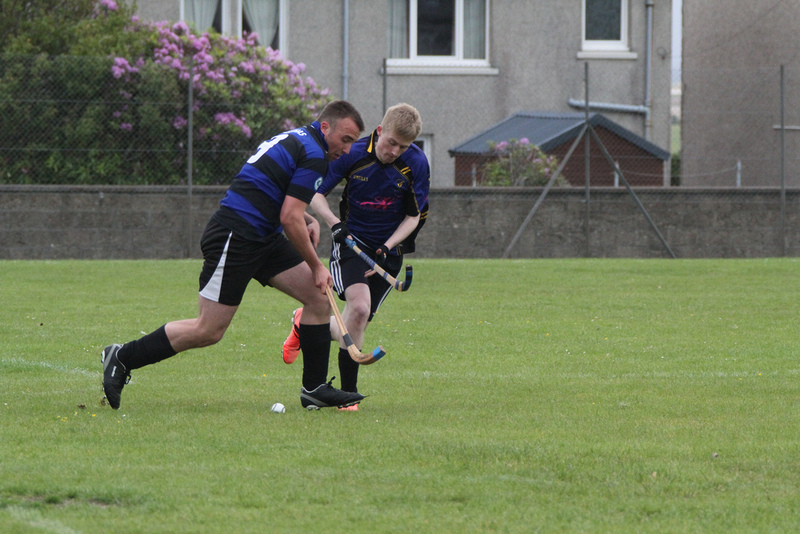 He has had a long passion for Gaelic Games and has continued this obsession with his active involvement in the Alba Gaelic Squad, having represented the team in all five fixtures to date, starting in Oban in 2007 and continuing in Portree in 2012. He has travelled to Ireland and his distinctive voice is known from the Tigh Chualain to the Tongadale. Sean was as delighted as anyone when the club entered league shinty in 2011 but a move to Glasgow half way through that first season led to a move to Tayforth Camanachd, where he gained some more experience. Halfway through the 2012 season Sean returned to Lewis and whilst he has been reasonably busy in the lead up to the nuptials, with appearances restricted to the bench this season, he remains a positive member of the club, not just a player but a supporter as well. A well known local personality, Sean always takes the opportunity to push shinty and Camanachd Leòdhais on everyone and anyone, although we aren’t sure yet if Joanne has assented to Black and Blue ribbons on the chairs. 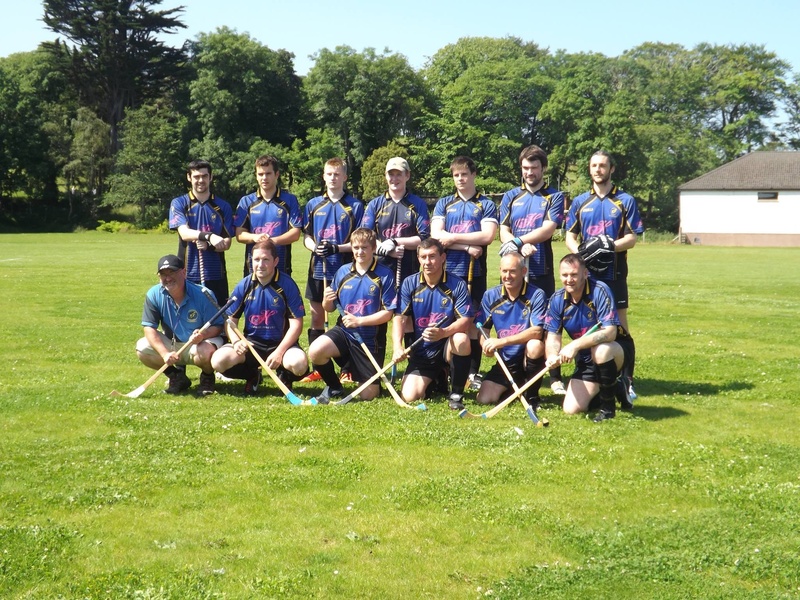 With more nicknames than you can shake a shinty stick at, from Bones to Rubens Banterchello via Seany Epic, we wish Sean and Joanne all the best for the future, gur math thèid leibh! This Saturday we welcome Kilmallie to Sgoil Shiaboist. 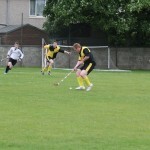 We have already played them in Caol this season, suffering a 4-0 loss although we were holding it at 0-0 at extra time. It is quite apt that the away game corresponded with Sean’s Stag Do, as he will be getting hitched to Joanne on the Friday before the match. There was a similar performance last year in Caol where we held them equal at halftime but lost 5-0, and Kilmallie repeated the scoreline when they visited Shawbost last year. 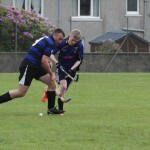 Kilmallie currently sit third in the table but will be eyeing Lochcarron nervously over their shoulders as there seems to be four front runners for the three promotion spots. Get down to Shawbost for the action starting at 2.30pm. Referee is Archie Ritchie. There are still several memberships outstanding. Please bring your £40 to the game on Shawbost on Saturday or get it to Diablo, Kenny Flip or Jinxy asap. 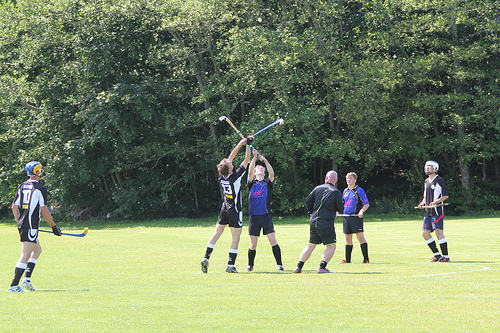 A big thank you to everyone who attended the 2013 Craig Morrison Stornoway Sixes. It was three years since the inaugural event and two years since the last one so it was great to see that four teams took part, Lewis A (In Woody’s Express Strips), Lewis B (In Harris Tweed Hebrides Strips), Kincraig and Uist, playing in their old Tigh Dearg Hotel strips, bringing back memories of the classic HebCelt games. The final was a pulsating game with the score equal after full time, with Ally Lamont having started with a streaking shot for the B team but Seumas Charity equalising after concerted effort from the A Team. 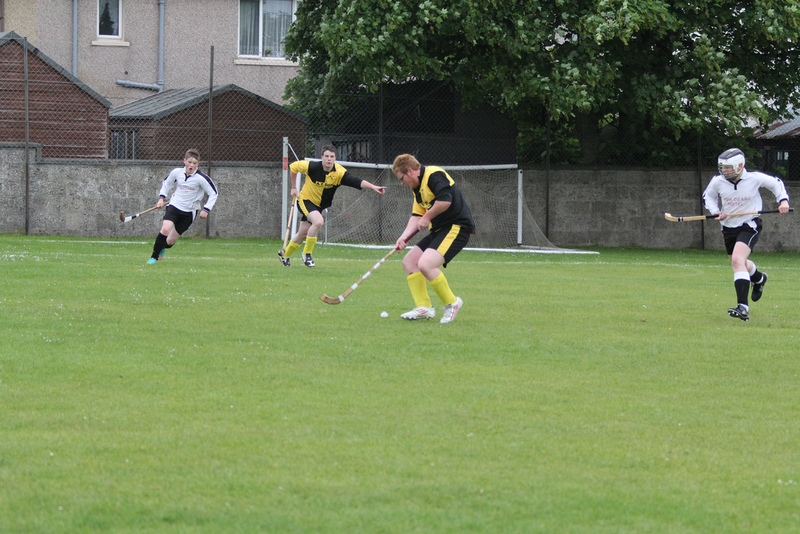 This led to penalties and those which did hit the back of the net were good quality strikes, Sean MacLeod and Graham Cay scored for the B Team but Will Church and a double from Duncan MacIntyre (yes we went back round!) made it 3-2 on penalties to the A-Team. Final Lewis A 1 (Seumas Charity) Lewis B 1 (Ally Lamont), Lewis A win 3-2 on penalties. 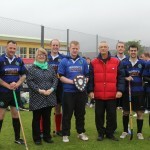 Of more importance was the fact that Craig’s family was there to present the Craig Morrison Shield to the winners. 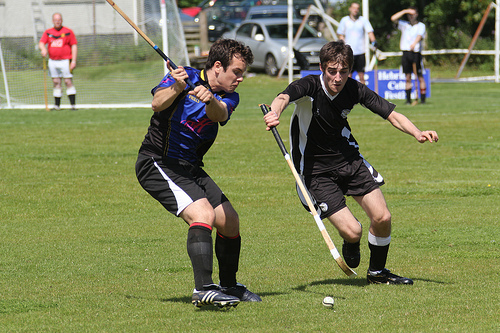 Craig was an integral part of Camanachd Leodhais in the early cup matches and his tragic passing at the age of only 20 is still felt to this day whenever the team takes the park. Diablo reflected on the fact that the club is one big family and Craig remains a part of that family. 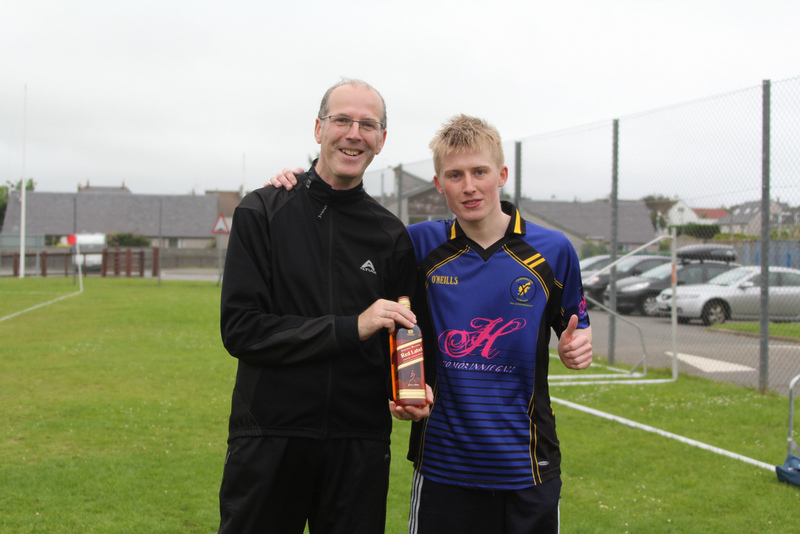 His mother said that he would have loved the day and we’re sure he would have agreed with the choice by John Nally of Peter Gomez as Player of the Tournament with a performance of grit and determination and also the absolute goal of the day, where he beat the whole Uist team ends up and cooly slotted it home. It was also grat to see Uist up in Stornoway and enjoying their shinty, and we look forward to seeing them at HebCelt.